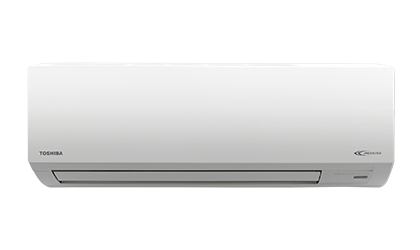 Toshiba Inverter Hi Wall Inverter 5 Star AC Split Online in India. Our products comply with RoHS Regulations, ensuring no restricted substances in each of the components. Non-flammable & non-ozone depletion, use of R410A refrigerant which is confirmed to be non-ozone depleting, non-fammable and non-toxic. Upto 40% power savings than conventional fixed speed hi wall split units. More precise room temperature control v/s fixed speed. Inhibits growth of harmful bacteria and viruses like H5N1. 12 flap setting, 7 speed motor input and auto cleaning function. The latest feature helps make today’s lifestyle more comfortable as it offers the benefit of saving electricity. POWER SEL* button, gives you the freedom to control power consumption of the air conditioner from a remote control by preventing high power operation. It helps you during electricity black out, and even when you need electricity for other appliances etc.